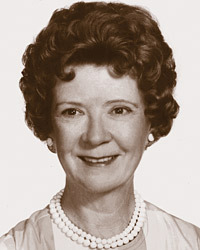 Edna Mae Burnam (1907-2007) is one of the most respected names in piano pedagogy. She began her study of the instrument at age seven, with lessons from her mother, and went on to major in piano at the University of Washington and Chico State Teacher's College in Los Angeles. In 1935, she sold "The Clock That Stopped"--one of her original compositions still in print today--to a publisher for $20. In 1937 Burnam began her long and fruitful association with Florence, Kentucky-based Willis Music, who signed her to her first royalty contract. In 1950, Burnam sent manuscripts to Willis for an innovative piano series comprised of short warm-up exercises; her hand-drawn, for-position-only stick figures indicated where "real" illustrations should be dropped in. That manuscript became the Dozen a Day series, which has sold more than 25 million copies worldwide; the stick-figure drawings are now icons. Burnam followed up on the success of A Dozen a Day with her Step by Step Piano Course. This method teaches students the rudiments of music in a logical order, for gradual and steady progress. She also composed hundreds of individual songs and pieces, many based on whimsical subjects or her international travels. These simple, yet effective learning tools for children studying piano have retained all their charm and unique qualities, and remain in print today in the Willis catalog.